Artica R5 is the perfect winter road cycling shoe for warmth, comfort, protection and performance riding in even the coldest, wettest conditions. Fully waterproof, easy to fit and featuring advanced insulation properties, Artica R5 beats the elements, yet is a lightweight and stiff high performance shoe. The Artica R5’s Internal Speed Lacing system makes fitting to your foot shape quick and accurate. Its Microtex Reinforced Shell offers structured support while the Breathable Membrane maximizes airflow. The waterproof outer is easy to clean and the waterproof zip ensures that the worst of the weather stays out. The Carbon Composite outsole – light and stiff for maximum power transfer – is combined with the supportive and comfortable fi’zi:k Winter Edition Cycling Insole, which features a cosy fleece upper and an insulating aluminum foil underside, for all-season warmth. 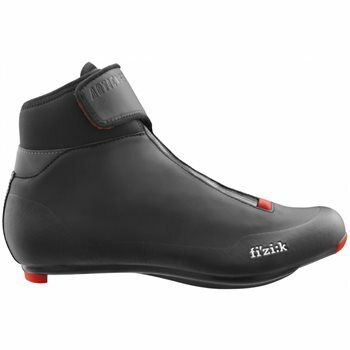 Like all fi’zi:k’s performance road shoes, the Artica R5 benefits from our program of designing with, and for, leading professional racing cyclists to create the best possible shoes for you, whatever the season. Sort compound rubber outsole with carbon reinforced midsole. Waterproof and breathable membrane upper and microtex reinforced shell. Sizes – 40-48 with half sizes available.